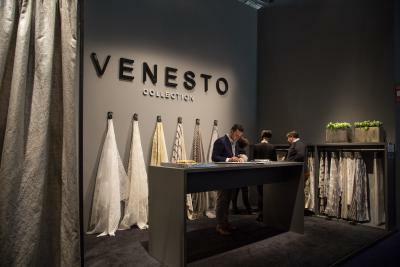 Especially for the Heimtextil 2017 exhibition Venesto brand has prepared a new collection. It was presented simultaneously with world premiers of the trends of the season by the Heimtextil team. A laconic conceptual presentation emphasizes Venesto's restrained European view on the aesthetics of decoration. Calm and natural colors convey the beauty of natural materials. They are combined with a mysterious cosmic brilliance and the radiance of metals. From 10 to 13 January, participants and visitors of the Heimtextil could get acquainted with new fabrics at the company's stand.